Inventive farm-fresh fare steals the show at this Old Fourth Ward live music venue. 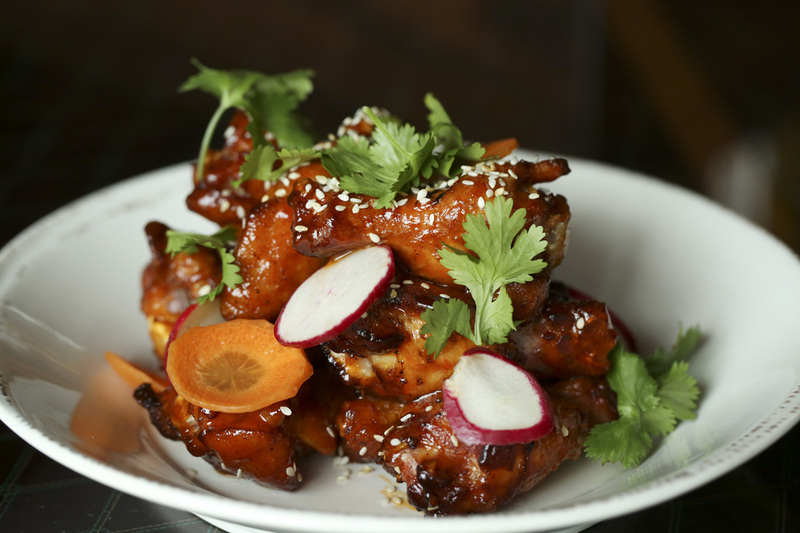 Smoked Springer Mountain chicken wings with gochujang pepper jelly, pickled carrots and sesame seeds. They say that to write a good review, you must, among other things, dine at the restaurant multiple times. Though I don’t get much sympathy from friends and family for fulfilling this duty (and I understand why), I can’t say I always enjoy this part of the job. Restaurants aren’t always good; the food isn’t always consistent; the service isn’t always on point. But when I got the assignment to write this piece on Venkman’s, Old Fourth Ward’s latest hot spot, I found myself finding any and every excuse to go there, well beyond what was required. One week, I was there three times. And it’s a good half-hour away from my house. Venkman’s is that good. 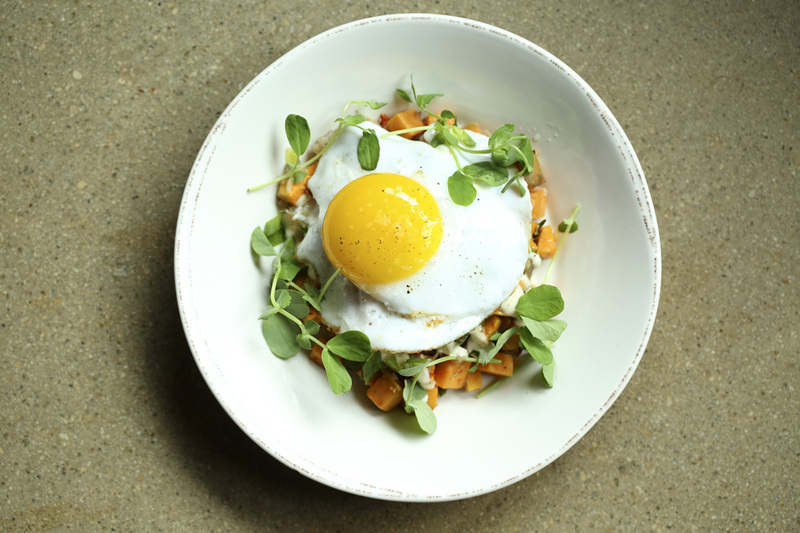 A brunch favorite, duck egg hash is a savory combination of duck leg confit, sweet potatoes, arugula and bearnaise aioli topped with a sunnyside up duck egg. It’s unsurprising, considering chef-partner Nick Melvin’s past performance (he’s the man behind those addictive Doux South pickles you see at every farmer’s market and artisanal food shop in town). Still, I have to admit I wasn’t expecting to find food this spectacular at a live music venue. In addition to being a hotbed for innovative comfort food creations (think Gochujang pepper jelly smoked wings), Venkman’s is also an entertainment venue. The brainchild of Nicholas Niespodziani and Peter Olson (the co-front men of Yacht Rock Revue and founders of PleaseRock), Venkman’s plays host to a slew of live shows, from local parvenus to national names, running the gamut from rock and roll to bluegrass, soul to salsa, circus performers to puppeteers. Sure, the trend of entertainment venues with chef-driven cuisine may be sweeping America right now, but few do it with as much integrity and talent as Venkman’s. Chef Melvin’s approachable yet innovative food can stand on its own—meaning a meal at Venkman’s is worth it even if there isn’t a show—or it can up the ante on date night, perfectly complementing the entertainment in a way that previously would’ve required two stops. 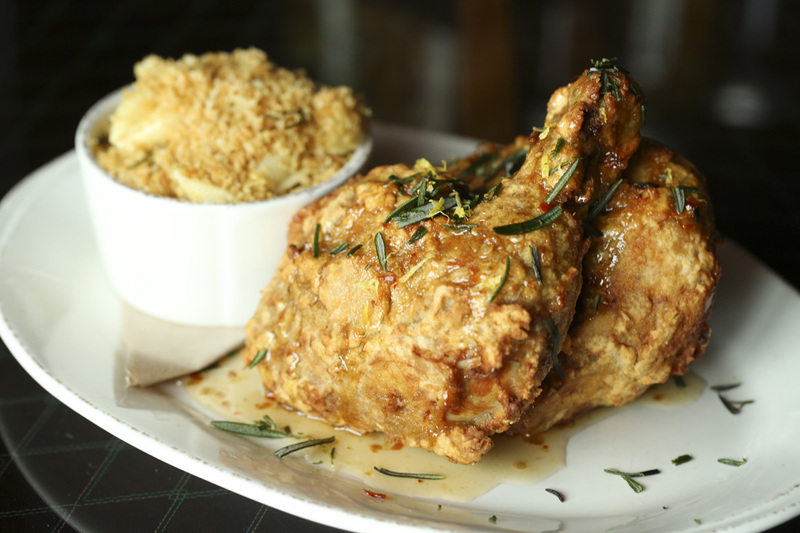 Venkman’s Cast Iron Fried Chicken is drizzled with hot sauce honey and served alongside pimento cheese and shells. Of course, no restaurant is perfect. After trying dozens of dishes from the various menus (Venkman’s is open for brunch, dinner, happy hour and late night), I did, admittedly, find one dish I could’ve done without. The pimento mac and cheese should’ve been decadent and bold but instead was somehow bland, seemingly unseasoned and, ultimately, lifeless. Despite that misstep, Melvin’s track record during my many visits still clocks in with more than a 99 percent success rate, which is to say, Venkman’s is as good as it gets. Much of the menu tells a tale of two Souths, as traditional tastes of the American South mingle with Southeast Asian flavors in dishes such as the lively flat iron steak, served atop an herbaceous crispy cauliflower salad dressed with a bright lime vinaigrette. Likewise, the duck tartare laced with fiery Gochujong (a special) tantalized. Mushroom lettuce cups, a vegan treat even a carnivore could love. Equally shocking for such a venue is the number of gluten-free, vegan and vegetarian options on the menu. 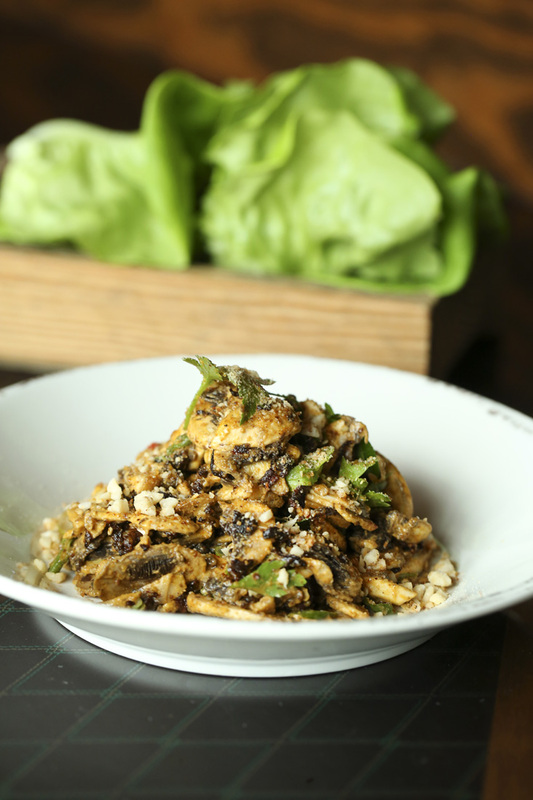 Don’t miss the mushroom lettuce cups, a crispy, herb-centric dish spiked with shiitake “bacon” and crunchy peanuts. The exceptionally textured arugula and sugar snap pea salad, tossed with vibrant mint, sharp Parmesan and a smoky charred lemon vinaigrette, is not to be missed. Perhaps the best item on the menu is a surprising skillet bursting with pickled beets and strawberries, smothered atop warm feta cheese and the most perfectly buttered crostini. It shouldn’t work, and yet somehow Melvin has wielded his chefly superpowers to make it one of the most exciting plates in Atlanta. Brunch is equally thrilling. Do yourself a favor and start with the breakfast poutine—roasted potatoes bedecked with pickled peppers, mozzarella curds and an umami-forward roasted mushroom gravy. 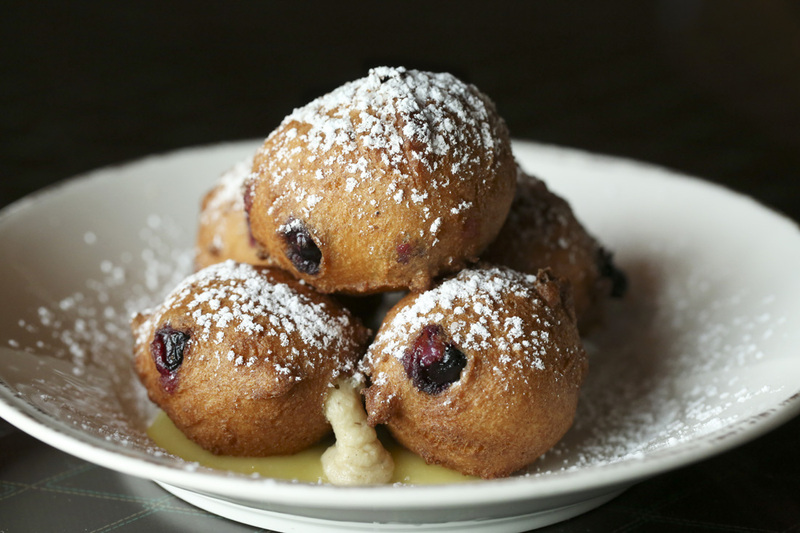 And the blueberry ricotta donuts, accented with tangy lemon curd for a sweet and sour masterpiece. Yes, you need both. Follow it up with the red chile chicken and grits or the luxurious duck egg hash, both of which come with flawless runny eggs. 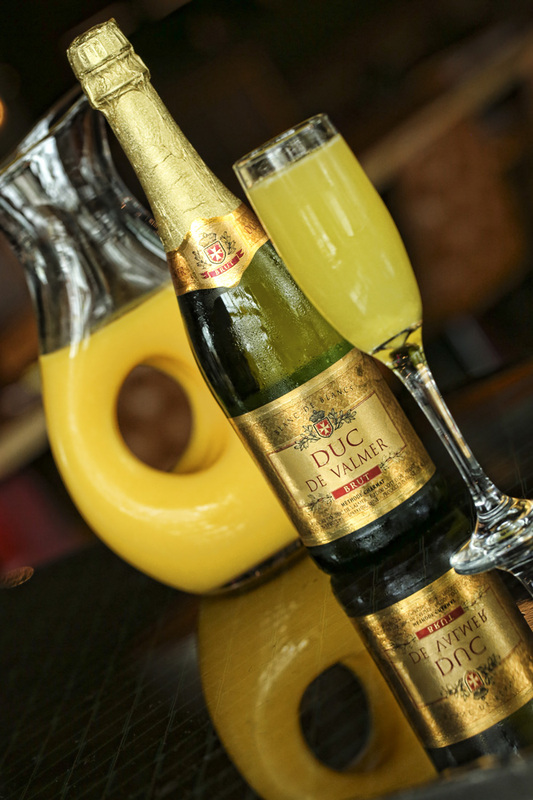 Bottomless mimosas—just $18 a person—are the obvious pairing, and the servers would sooner have you dine at IHOP than take a sip without having your glass immediately refilled. 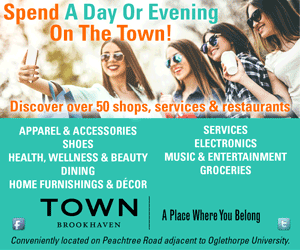 When the weather cooperates, opt for a seat on the patio, though if there’s a performance, inside is preferred, particularly a seat with a view of the open kitchen and the stage. Designed by local architecture firm ai3, Venkman’s is reminiscent of a vintage lounge you might find in New Orleans or Nashville (see the red velvet curtains, cozy leather banquettes and industrial details, from concrete floors to exposed beams). Puffy blueberry ricotta donuts are piled high, served atop lemon curd and dusted with powdered sugar. 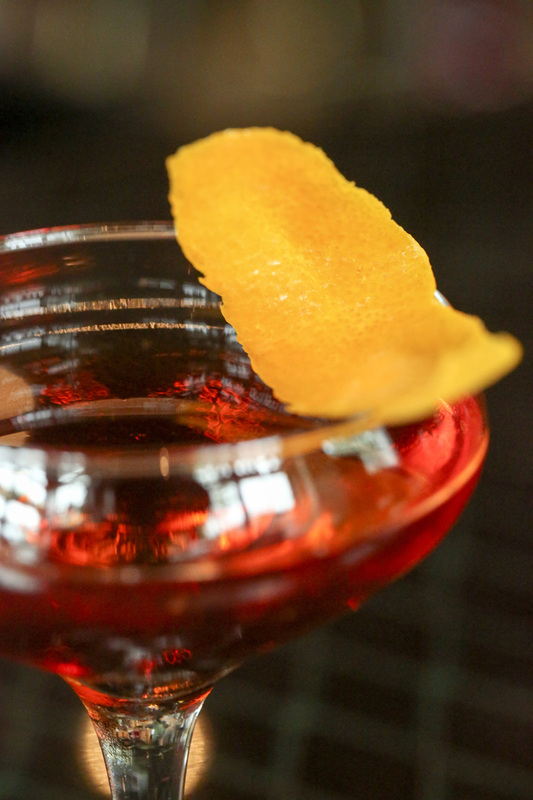 Order up an Azzurri cocktail, a vibrant blend of bourbon, sweet vermouth, Curaçao, Campari and black walnut. Alongside the thoughtfully crafted cocktails barman Pieter Guilbault stirs up—start with the boozy Azzurri (Bourbon, Sweet Vermouth, Curacao, Campari and Black Walnut) before moving on to the signature slushies, or a glass of rosé on tap—Venkman’s perfectly encapsulates Modern Southern culture in the capital of the New South. Cheers to that! Bottom line: Innovative comfort food creations alongside killer live music and cocktails.